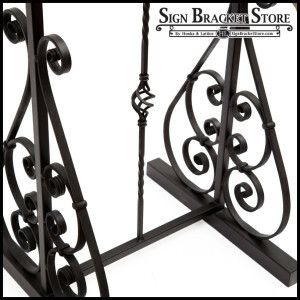 It’s important that wrought iron artisans weld everything by hand for a superior quality product. Business managers and store owners are all well aware of the importance of real-time advertising. Brick-and-mortar locations including coffee shops, clothing stores, and specialty retailers use outdoor signage to increase their customer base, especially in areas with high foot traffic. No matter what your company needs to promote – monthly or weekly specials, an upcoming sale, or general new product information, you can turn your storefront into an advertising arena with the help of heavy duty outdoor sign frames. Our sturdy equipment is strong enough to showcase your message even through inclement weather. 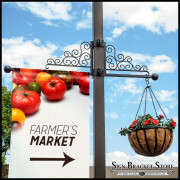 The Decorative Sign Holder With a Twist can display 18″W x 24″H double-sided posters. 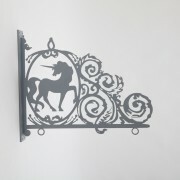 Since your signs can be inserted and removed via the top, you won’t have to bother unscrewing or taking apart any pieces. This holder’s powder-coated black shaft is designed with a twisting motif that gives it a vintage feel. It’ll bring a touch of class to the exterior of any establishment. 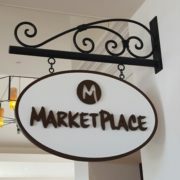 Since the base is an entire square foot, setting this sign holder outside with low to medium winds won’t be an issues. Mount via direct burial or make it mobile with a weighted iron base. Lovely for restaurants, our Decorative A-Frame Folding Sidewalk Sign will catch the eye of everyone who walks or drives by. Ornamental ironwork adorns the top and bottom of each side which fold out to form an “A” shape, and fold back in for easy storing and carrying. It’s truly a sophisticated take on average sandwich signs. Aluminum sign blanks for this model are also available for purchase. If your business could benefit from a less decorative approach, there’s also the Dry Erase Writable Folding Sidewalk Sign. Dry-erase sidewalk signs are perfect for diners or cafes that change their specials daily. Is there a convention or special event in town? You can use lightweight A-frame signs to welcome tourists to your community while informing them about your business’s deals. This traditional A-frame sign has a 36″ x 21″ area for messages that can be changed without delay. Four markers are included so that you can write concise content for your customers. Even though all of these sign holders are big enough to draw attention, they also come in multiple parts. 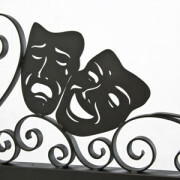 When not in use, you can simply slide these outdoor sign frames into closets, basements, or any other storage area. 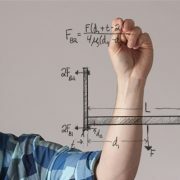 Their portability enables business owners to move them on a whim. 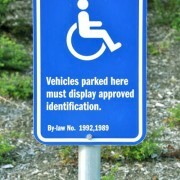 Make sure to frequently change the content of your outdoor signs. Doing so will do more than pique your customers’ interest: it will make them spread your information to their friends and family via word-of-mouth, and that’s advertising no one can afford to lose.